This is a simplified version of the 'tail-chasing' random patch described by Allen Strange and adapted by Doepfer in the manual to their A-149-1 Buchla Source of Uncertainty tribute. What surprised me is how well-suited the smooth out is to driving the clock/ chaos control: it doesn't need further attenuation - it's just plug and play. Today's second patch tip - how to 'freeze' an LFO - comes courtesy of Dieter Doepfer. This was something I hadn't thought of doing until I saw Chris Muir's Periodicity for the Buchla. 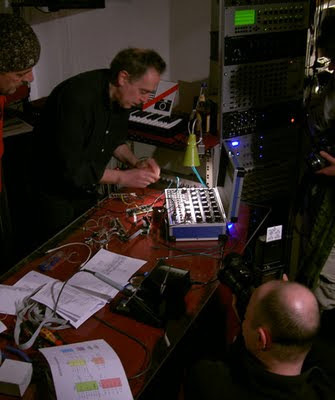 I could see how one could achieve this if the LFO was digitally generated, but wondered if there was an analogue solution and asked Dieter after the workshop. 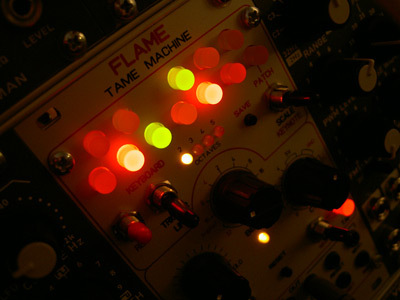 He explained that there was indeed a very simple, if imprecise, analogue circuit but, given a VCLFO like the A-147, it could also be patched by feeding a negative voltage to the LFO's CV input and forcing it to slow down to a crawl. In the patch, I sent the -ve signal to the A-147 via a VCA, which I opened with a manual gate from a Choices joystick. On release of the gate, the LFO races back up to its original speed and continues more or less where it left off. Thanks for the tip Dieter! 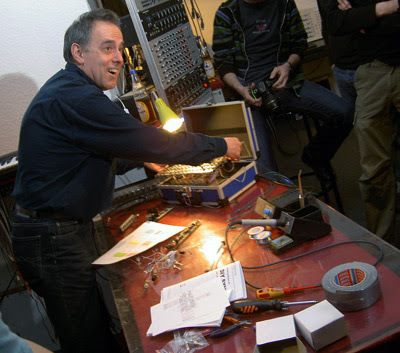 Some images from Dieter Doepfer's workshop, held last night at Schneidersladen. Andreas & Dieter get to grips with the Melita 106 filter. The DIY synth packs loads of features into an affordable board and sounds great. The filter has real weight and, if desired, very aggressive resonance. Standard op amps are used throughout, so no obsolete Curtis parts to worry about. 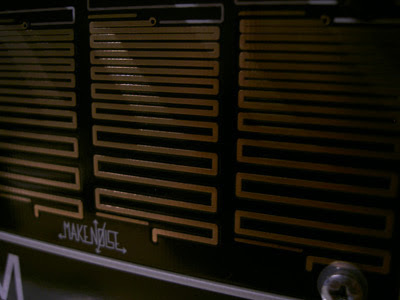 For more info, check out the DIY synth product page. 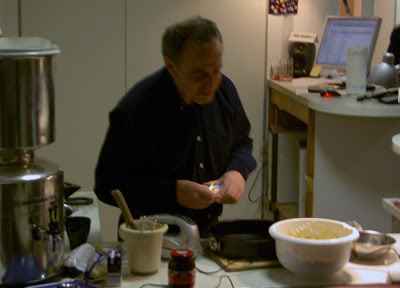 At times it was hard to concentrate on the electronics with the mouthwatering smell of fresh baking wafting in from the adjacent room, but it was worth the wait. 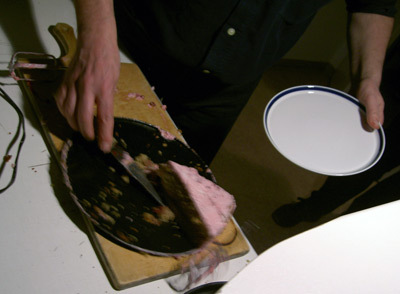 Thanks to Dieter and Andreas for a lovely, informative evening and delicious cake! Using Maths to convert a gate to trigger to ping a filter. To get really percussive sounds when pinging a filter you need an extremely short impulse. Envelopes are either too long or generate a decay phase which can lead to a misfiring of the filter. To get clean, short spikes feed your gate signal to Maths' channel one, set R&F to zero and patch the EOR out to your filter's audio input. You can vary the trigger length by altering the fall time or, for more subtle changes, the response curve from log to exp. In the example I've used the Pressure Points to generate the gate signal which is fed to Maths for conversion, row one to provide a pitch CV and row two to set the dual peak spacing on a Cwejman MMF-1. Can't be long before it's available! How to invert digital signals by analogue means. Today's patch tip is the result of my frustration with Doepfer's A-160 clock divider and the fact that I don't own an A-166 Logic module. Which is fine for some applications but not when you want all divisions to start on the same, i.e. first, beat. Hook up a couple of sequencers or try to programme a 'straight' drum pattern with an A-160 and you'll soon see what I mean. ... exactly the opposite of what the A-160 pumps out. An A-166 Logic module, with its two digital inverters, would offer a work-around. As I don't have one, I wondered if I could press one of my other modules into performing similar duties. I found the solution in my Bananalogue/ Serge VCS and Make Noise Maths. Both offer an 'End Out' gate which goes high on completion of a cycle. Patching a Logical 'high' from the A-160 to their inputs causes the End Out to go 'low', in effect inverting the digital signal. For this to work properly, use the 'input' rather than 'trigger' jack and set both the rise & fall times set to zero. With Maths, use channel 4's EOC, rather than channel 1's EOR. While I don't have enough modules to invert all the outputs of the A-160, this method at least allows me the option of forcing some to play 'on the one'. Live performance patch featuring 4 VCOs, 2 LPGs, 4 EGs, quantizer, analogue shift register, mux, Choices, Pressure Points, a bunch of mixers & VCAs and a pair of hands. As you can tell from the long list of modules, this patch took some setting up, but was quite simple once I knew what I wanted. The combination of PP & Choices offered a variety of control options and made this patch come to life. You can probably guess most of what's happening in the recording, so I won't go into detail. One tip I'd like to share with you, though, is how I controlled the Low Pass Gates as this was key to the patch. I mixed Choices Y output with the envelopes to open the LPGs for the sustained sounds and then close them for the short note runs. Really simple, but effective. And if you're wondering how I achieved the slow, rising pitch in the sustained passages, that's the sound of a voltage-loaded but un-triggered Plan B M23 ASR! A collection of recordings and patch ideas, focussing on manual manipulation and featuring Flight of Harmony's Choices joystick and Make Noise's Pressure Points touch keyboard. In this first Pressure Points patch, I fed the X & Y rows to an A-151 sequential switch and the bussed gate to a clock divider to generate an eight note sequence. The bussed press CV was used to provide volume control. This is a simple patch to overcome the limitations of only having one PP and also provides variation on an otherwise predictable sequence of notes, depending on the division you use to trigger the multiplexer. Variation on the above. 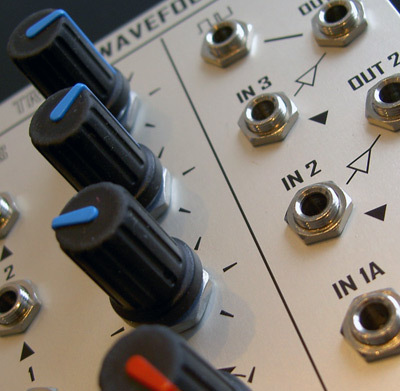 Press CV used to provide mild pitch bend of a self-oscillating filter and modulate the frequency of an LFO . In this patch I sent the press CV to a quantizer via a slew limiter to generate a glissando effect in addition to the main pitch CV. I used row X to set different slew rates, the effect of which you can hear towards the end of the recording. Make Noises' Pressure Points brings the capacitive keyboard, best known from Buchla and Serge systems, to the Euro format. This sort of controller might not be as immediate as a joystick but it offers a wealth of subtle possibilities. PP is tweakable and, given the right settings and playing style, responsive. For best results with the press CV, a slew limiter like Maths is a must as is an exponential VCA for dynamic volume contours. It is possible to confuse the circuit with rapid finger movements or multiple presses but, as Tony Rolando points out, this is the nature of the beast. It'll be interesting to see what the promised Points Expander brings to the party. PP transposes the sequence and generates volume levels (both signals slewed by Maths). Choices provides panning control and cross-fades between the sine and PWM (row Y sets rate) outputs of a Plan B Model 15 VCO which is filtered by a M13 LPG. The manual gate is used to open a VCA containing the output of PP's row Z, which is used to change the speed of the clocking LFO. For more programmer patch tips, run a search for the Rich Gold Serge book and Buchla Music Easel manual. First up, Choices is used to modulate the FM relationship of two VCOs and the time-base, or overall length, of a Plan B Polyphonic Envelope. 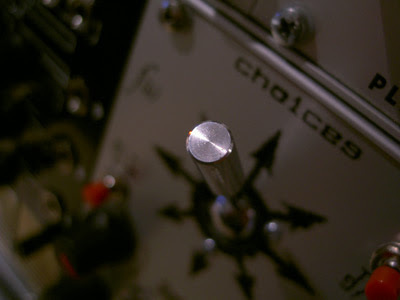 Choices' manual gate was patched to the M10's cycle input to provide the trills. In this patch, Choices was used to manually trigger the envelope. Depending on the modulated envelope length, this sometimes results in trills. The joystick was used to modulate the pitch of the VCOs and provide the CV for an A-134-2 cross-fader. A similar patch, minus the cross-fader, of 'chirps and cheeps' generated by a self-oscillating filter, FM'd by the modulated envelope. Using a joystick is very intuitive and a lot of fun: move it, and you have a pretty good idea of what's going to happen. I considered getting Doepfer's A-174 because I like sprung joysticks. As it was out of stock and a new shipment of Choices had just arrived, I bought the f(h) module and have no regrets: unsprung joysticks have their own benefits and the manual gates are very useful. Choices has a hotter output than the A-174 and offers more control over in & ouputs. Match this up with an integrator, quantizer, cross-fader and a re-triggerable AD envelope for a dynamic performance tool. Some more examples of the wonderful Toppobrillo Triple Wave Folder. 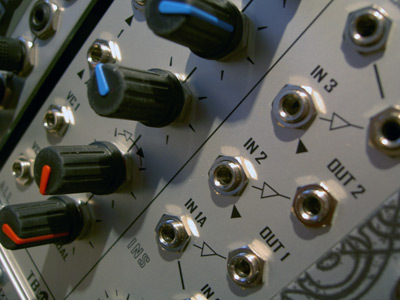 Self-running patch comprising two VCOs & VCAs, Maths & Wogglebug. One VCO is folded, the other modulates the TWF's Bias, WB is triggered by Maths' EOR, stepped out to pitch, envelope slopes and WB clock. Recorded in response to Rechner7's Stockhausen-esque Noise Ring/ Pressure Points patch. Wavefolders respond to dynamic changes, so I gated both the carrier and modulator before sending them to the TWF. This can have a dramatic effect and this patch would not have sounded the same had I gated the output post folding. Again, the VCO was first sent to a VCA. 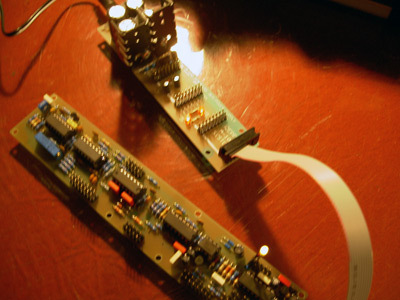 An envelope modules the bias, manual tweaks to envelope times and DC offset. Pure sine first, then folded. This sort of sound is normally quite tricky to achieve via analogue FM, because of phase and tracking issues. Here's an evolving sound featuring a sine wave some light envelope modulation of bias and manual tweaks. The Triple Wave Folder has so many sweet-spots for this kind of tonal shaping and the output is clean enough so you don't need further filtering. As you can hear, it does a great job. I asked Josh about the rounding of the saw evident in the 'scope shot and he confirmed that this is normal. He also explained how he achieved the panning effect in his demo: the resulting sine is 90 degrees out of phase so all you need is a multi-output LFO/ oscillator. Thanks Josh! 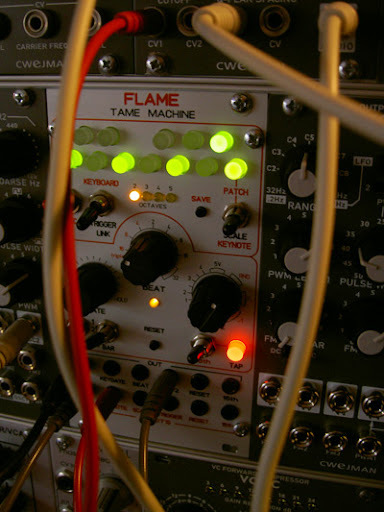 Two patches/ applications featuring Toppobrillo's Triple Wavefolder: first as a traditional audio waveform multiplier, then processing an LFO to generate syncopated rhythms. Although the TWF is capable of creating more extreme sounds, especially when fed with polyphonic or FM'd material, in this first recording I've kept the settings fairly tame. For the plucked banjo sound two stages of the TWF processed a single sine wave which was then filtered by a Wiard/ Malekko Borg. The bias was modulated with an envelope. The guitar sound was similar, with the exception that I modulated the DC offset with an LFO. The Hammond/ Leslie-like sound was the result of three stages folding an exp. FM sound from a Cwejman VCO-2RM, an oscillator the TWF seems to love. 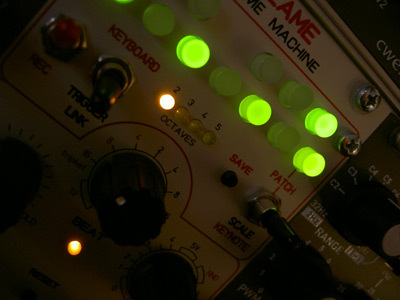 The kick drum is triggered by the pulse out of a Doepfer A-147 VCLFO, the FM click sound by the folded signal and the FM klonk by a subdivision of the same (A-160). In the first 40 seconds I adjusted the bias settings of the three folding stages, thereafter I altered the DC offset. This was a lot of fun and the results are certainly useable. The Toppobrillo Triple Wavefolder has been a revelation to me - despite having built my own CGS Lockhart Wavefolder and tried Doepfer's A-137 and the Bananalogue/ Serge WVX, I never quite 'got' wavefolding/ multiplying. The Toppo sounds fantastic - to my ears, the best of the bunch - and its open nature makes it a flexible tool: you could, for example, tap the output at stage two, send it to a resonant filter it and then return it to stage three for some final folding. I managed to coax subtle plucked harp sounds through to aggressive sync-like 'digital' basses from this module, all with minimal fuss. Its taken me a while to cotton on, but the Toppo has opened my ears to wavefolding and got me inspired. Thanks to Herr Schulz at Schneiders for his almost missionary zeal in recommending the TWF!